At Bellator 204 in Sioux Falls, South Dakota, James Gallagher—the Conor McGregor teammate who Bellator is clearly incredibly high on—moves down a weight class, from featherweight, where he was slightly undersized compared to the average fighter, to bantamweight. “It’s been going perfect, it has,” he said of his weight cut when talking to FIGHT SPORTS last week. For his first challenge at 135, Gallagher is facing Ricky Bandejas, a 10-1 prospect trained by Nick Catone. Whatever your opinion is of Gallagher, it’s a big step up for Bandejas in terms of stage, as he’s only fought close to home in the regional Caged Fury Fighting Championship up to this point. This is his first ever fight with any sort of substantial travel. Does Gallagher see that as an advantage for him, since he has already had to go far away from home to fight? So what’s his personal solution? While Gallagher-Bandejas is on a card headlined by bantamweight champion Darrion Caldwell, Caldwell has moved up to take a fight at featherweight against Noad Lahat. It makes a statement about just how open bantamweight is right now. 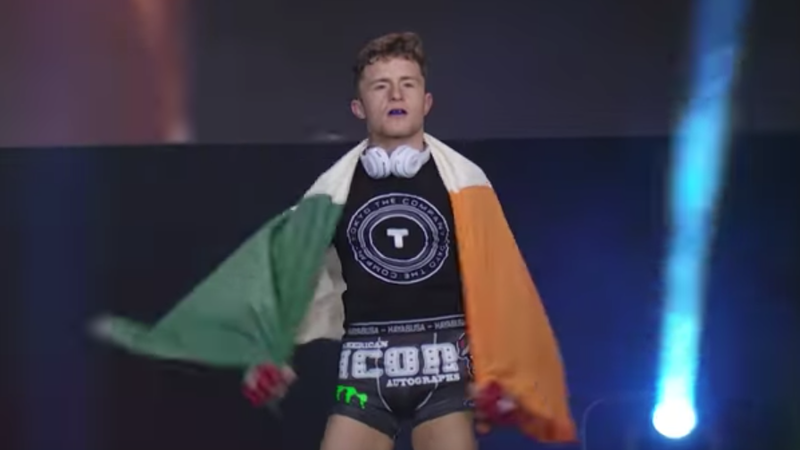 With that in mind, how far does the Irishman think he is from a title shot if he wins tonight in Sioux Falls?